What is the Value of Productivity in Your Operations? Continuous improvement and lean manufacturing are top-of-mind with manufacturing and distribution organizations worldwide. The concept is that incremental changes can result in major cost wins for the organization. In a recent real-life client test scenario, high quality casters proved to be effective in increasing worker productivity by 10%. When factoring in wage costs of workers, this translates to significant productivity improvement related cost savings. A leading consumer products distribution company with over 200 fulfillment centers based in Asia. Warehouse Associates (WA) work to move products by pushing carts through the warehouse and manually pick ordered parts from inventory. They then deliver picked inventory to a fulfillment station for packaging and shipping. Same day shipment to customer is a key marketing success factor for this company. Existing carts use 4” urethane wheels on concrete floors. This causes several issues: 1. Unnecessarily high noise levels. 2. Frequent maintenance and change-out requirements and associated costs. The typical WA travels 16 km (10 miles) per shift. Time-studies showed declining worker output throughout the course of their shifts. This loss of productivity requires increased staffing to meet goal of same day shipping. 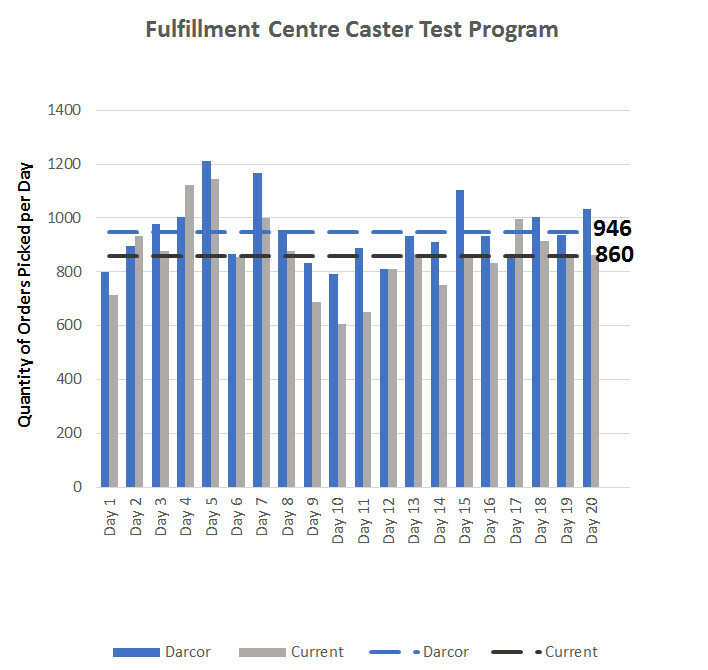 Darcor worked with the client to implement The Fulfillment Center Caster Comparison Program – a customized program to help the client pursue continuous improvements via their cart/caster equipment. Control carts were equipped with new 4” diameter urethane wheel casters – the same casters that were regularly in use. Test carts were equipped with Darcor 4” Solid Elastomer casters (Darcor 16-74-PSE). WA were not aware of the undertaking caster comparison program in their order fulfillment center. WA productivity was monitored over a 20 day period and results were assessed to determine productivity by caster type. The test carts which were equipped with Darcor’s caster averaged 946 orders picked per shift while the control carts equipped with the traditional urethane casters averaged 860 orders picked. Darcor-enabled carts achieved a 10% increase in productivity which was determine through the Fulfillment Caster Comparison Program. To achieve the same productivity, the fulfillment center would need to use only 10 Darcor caster equipped carts for every 11 carts outfitted with current urethane casters. This would mean 40 Darcor casters vs. 44 existing urethane casters. To achieve the same productivity, the fulfillment center would save the wage cost of one WA annually. In this case, the client was based in Asia where an WA’s annual wage is approximately $10,000. This equates to a savings $250 per Darcor caster ($10,000/40 casters). This is a major cost savings and can be extrapolated for larger fulfillment centers and drastically increases when considering North American wages. However, this is just scratching the surface of potential cost savings. Consider maintenance and replacement cost savings – the ERGO LONGEVITY™ performance of Darcor casters means that the casters will have a life span of greater than 3 years in this environment compared to the current casters which are replaced annually. There has been a noticeable decrease of on-the-job fatigue and an increase in employee retention through job satisfaction. Darcor casters’ wheel technology provides high performance and reduces push/pull forces. Push/pull forces are the quantitative measures of the force required to move and sustain a cart’s movement. 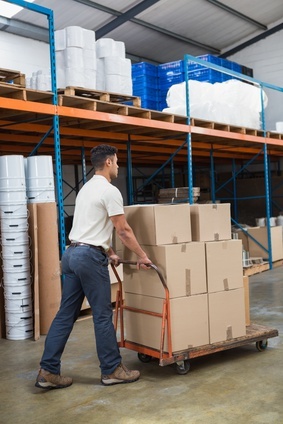 An associate can easily, safely, and efficiently move products. This means less change of injury in the field. Decreasing the risk of injury, translates to lower injury-related costs of the company. The $250 savings calculations is based on single shift operation. In fact, this is a 24/7 facility, so the cart is utilized for four shifts which translates to a $1,000/caster savings annually. Wages for WA in Europe and North America can be up to 3 times higher than Asia. This multiplier would directly translate to a 3 fold increase in savings per shift. Despite the significant savings, the increase in cost per caster has to be taken into consideration. Typically a high performance Darcor caster could cost $40 more than a competitor caster. Even considering this higher price caster, the ROI on a single shift at this particular Asia-based fulfillment center is greater than 500% ($250 savings for $40 incremental cost). The incremental cost is recouped in less than 3 months. This does not take into account a multi-year caster life expectancy, 24/7 multi-shifts, higher costs of wages in North America and Europe cost savings. In a North American scenario, incremental cost would be recouped in 5 days. After running through the financial benefit of switching to the Darcor casters, the client realized the financial toll that low performance/low cost casters were taking on his operations budget and the client advised, “Even if those casters were free, I could not afford to use them!”. Find out more about choosing the right caster to support your productivity and ergonomic needs. Rigid Caster, Rig made of pressed steel, bright zinc finish. Solid Elastomer wheel tread, Ball bearing. Rigid Caster, Rig made of pressed steel, bright zinc finish. Neoprene wheel tread, Ball bearing.